NEW for 2018: Supper at Tall Pines Cafe’, Ladies for Liberty daily at Interview Circle, Charlie’s Park Dedication. NEW FOR 2018: Tall Pines will be serving supper and snacks Monday, Tuesday, Thursday and Friday during convention. Expanded Vintage Bookstore. Located just south of the Vintage Hangar in Rose Plaza, the Vintage Bookstore has accumulated a large and varied inventory of used and/or out-of-print aviation books. Jennifer and Chris invite you to come and buy a book, browse, or just take a break. Come and read a while on our covered front porch. 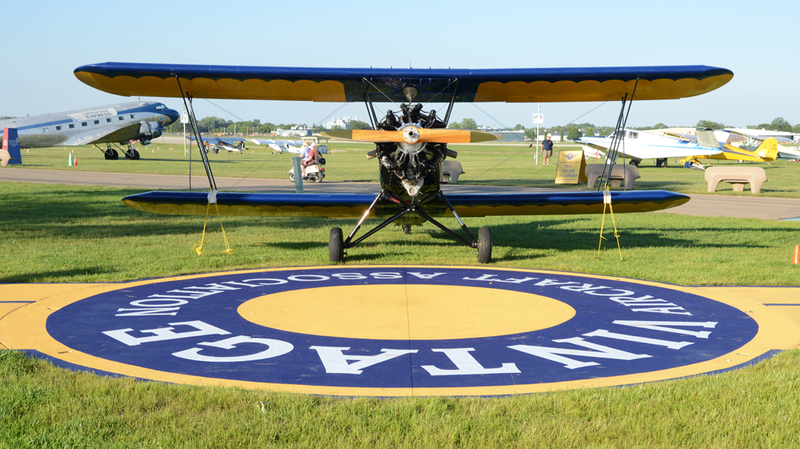 The VAA Bookstore will accept donated books during AirVenture as well. Donated books can be tax deductible since VAA is a 501(C)(3) corporation. 10:45 am – Vintage in Review opened each day by the Ladies for Liberty at Interview Circle in the Rose Plaza just east of the Vintage Hangar. 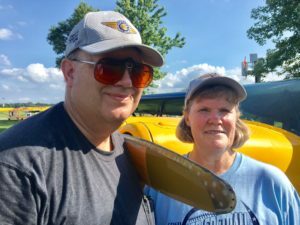 Ray Johnson interviews the owners and restorers of many beautiful and unique vintage airplanes beginning at 11:00 am Monday through Friday. Red Barn Hospitality and Information – Sandy and Barry Perlman host the Hospitality area in our completely refurbished Red Barn HQ. They have information, emergency phone numbers, schedules of events, popcorn and lemonade. They can also arrange some transportation on and off the field. You can pick up your participant plaque if you flew an aircraft into the vintage area, or purchase tickets for the Vintage Picnic held on Wednesday at 6:30 pm inTall Pines Cafe. All of this they do with a big smile. Vintage Tram Tours Daily – Departing from the front yard of the Red Barn every two hours. 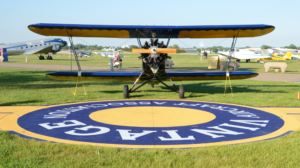 Jim and Mary LeFever will take you through the flightline for close-up views of an amazing variety of vintage aircraft. 11:45 am – Charlie’s Park Dedication at the new back porch (just west of the Vintage Hangar). 9:00 am – Presentation of the FAA Technician of the Year Award to VAA Hall of Fame member and long-time Vintage supporter Bill Pancake. FAA Building next to the Control Tower.